We are starting to get oversold enough on some secondary indicators where a cursory bounce would not be out of the question, but excluding the era of "V shaped" moves, that sort of bounce should not have much energy. With light trading days Friday and then Tuesday around the Memorial Day holiday - that could be where that sort of bounce happens (plus it's month end "mark up" time), barring some exogenous European news. But really that sort of action is just for the nimble daytrading or 1-3 day swing trading types. 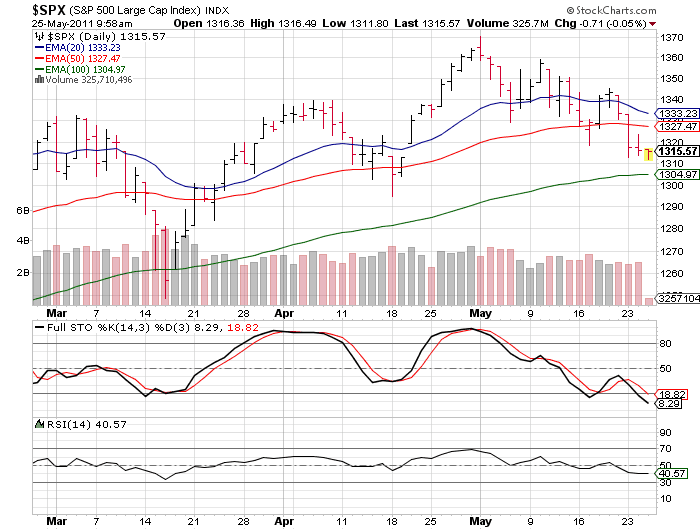 At the minimum we need to see this market return back over the 50 day moving average (upper 1320s), and better yet make a new higher high in the mid 1340s, to put back on our happy face. Prior to 2009 what I'd expect is a weak sort of bounce in the next few days to relive some of the 'oversold' readings.... that would be an excellent opportunity to remount some short exposure. We'll see what happens in this new era. For bears, a break below the intraday lows of the past 3 days remains the goal. 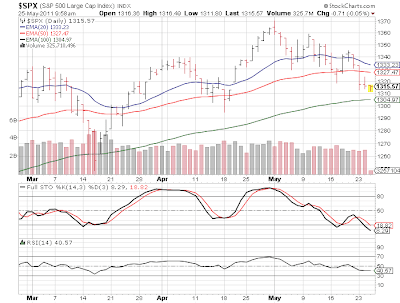 The 100 day moving average has moved up from 1301 to 1305 the past few sessions, so I'd expect a stand there for the bulls - if the S&P 500 does indeed break through the lows of late. If that 100 day breaks, it will be very interesting; that has only happened 1 day since September 2010. In terms of % of stocks in the S&P 500 below their 50 day moving average, we are at a 'bottom' if this is only going be a mild correction, but obviously nowhere near that if the market is headed for a more serious episode. This is a very slow motion selloff, which is actually a lot harder to make money shorting indexes than the dramatic swoons.